Okay, first off, The Subtle Art of Not Giving a F*** is a hit. If you’re like me you will gasp, crook your neck and call a friend to discuss several chapters but you will learn a lot which is why I included it in the challenge. That’s definitely not his sentiment. 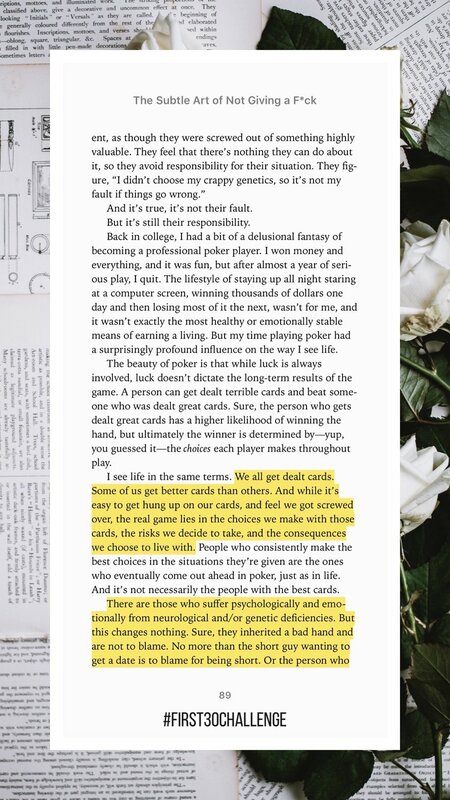 Mark Manson identifies that we have all been dealt different hands in life - some better/worse than others and unfortunately we cannot control that. What Manson is very adamant about is HOW we respond to our cards. We have a choice in every circumstance and situation that comes our way. Even when we make no choice, we made a choice. This part shook me. You know those situations when you quickly exclaim, “I DIDN’T HAVE A CHOICE…” these days I’m not sure if that’s actually true. You always have a choice, sometimes you don’t have time, resources or just the knowledge to make the best choice but as we begin to identify our power we also identify our responsibility in the choices we make. Basically, the blame game is out, stepping-up is in. Would love your feedback on the pages below.